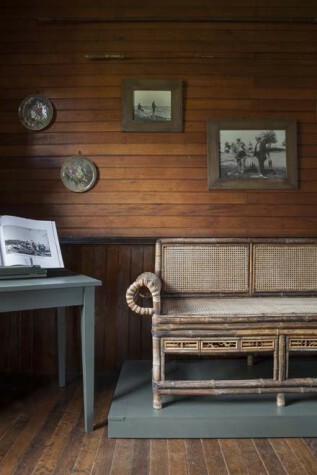 Homer’s daybed and mounted fish trophies are complemented by reproductions of photographs of the artist and his family. The objects illustrate the story of his everyday life at Prouts Neck and the importance of his family to his daily activities. The fireplace required careful preservation. 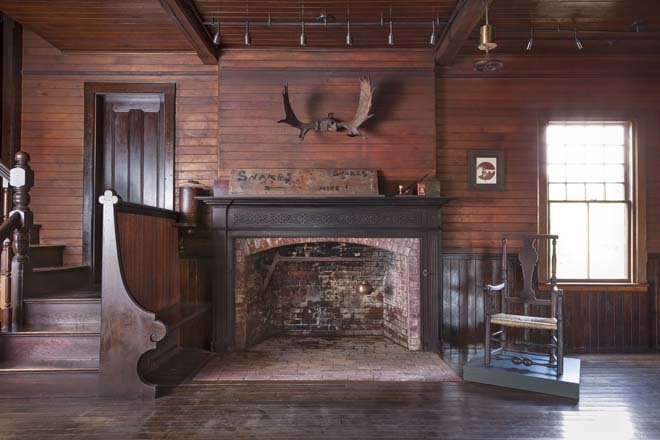 The bench beside it is called an inglenook, a hallmark of John Calvin Stevens’s designs. 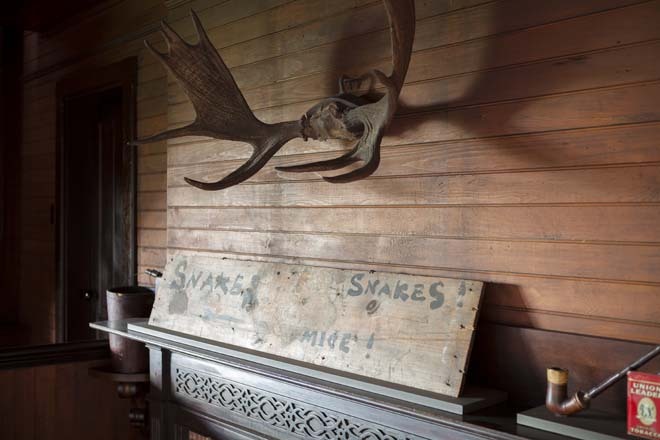 Homer’s pipe, tobacco, and chair—as well as the “Snakes, Snakes, Mice!” sign—were found in the studio. The library includes a selection of period-appropriate books that Homer had on this shelf, including a three-volume set of Sherlock Holmes and The School for Scandal. 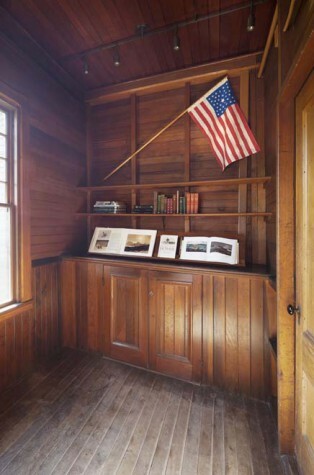 Portland artist David Wolfe made the silk-screened reproduction of the 1860s American flag that would have hung here in Homer’s time. 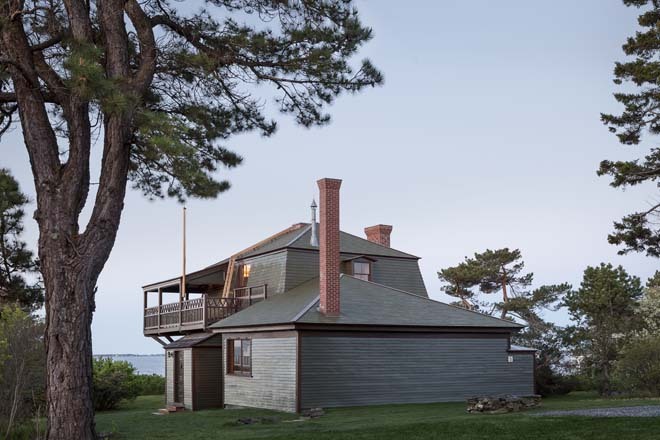 Winslow Homer was 47 when he moved to Maine, to his family’s property in Prouts Neck on a rocky edge of the Atlantic. The year was 1883, and the painter had already made quite the name for himself as an artist. 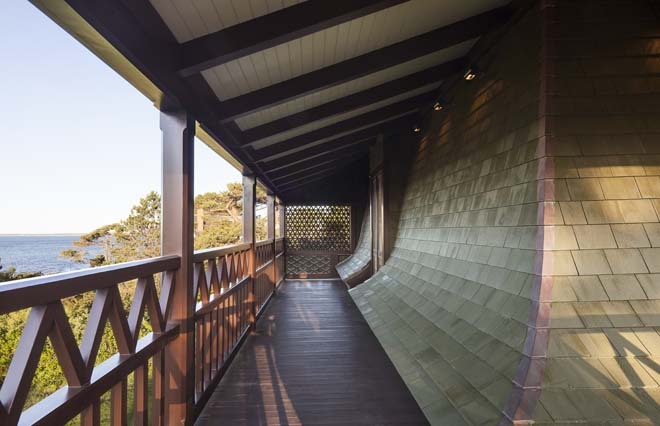 He took up residence in the family carriage house, which was remodeled for him into a studio by architect John Calvin Stevens. 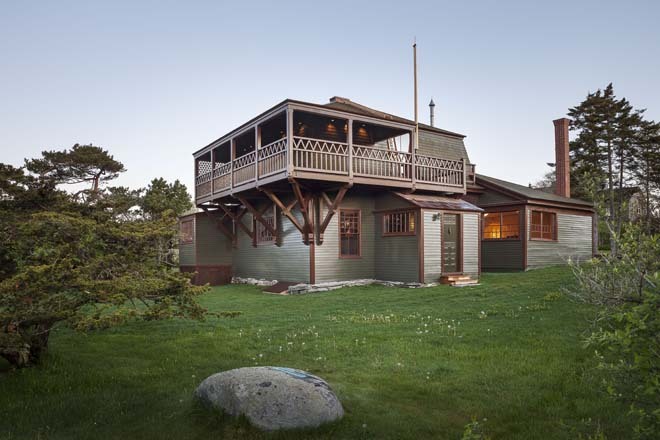 Among the renovations, Homer had some requests: add a balcony overlooking the sea from which he could sit and watch the waves, move the building 100 feet away from his family’s house, and change the front door to the back. Homer made no apologies about seeking solitude. 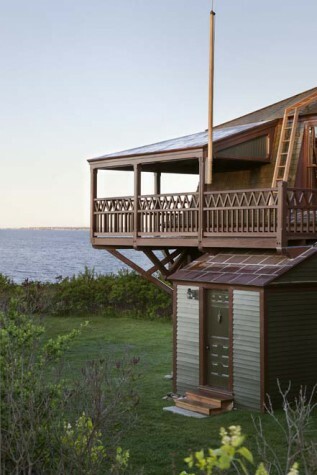 And in the years that followed in that green clapboard studio by the sea, he created his masterpieces. After Homer’s death in 1910, the studio was passed on to his descendants, and in the 1960s, it was named a National Historic Landmark. 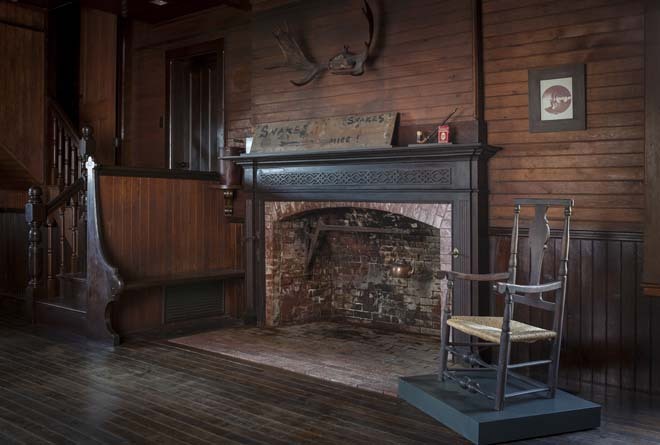 Looking to preserve Homer’s legacy and save the structure from disrepair, in 2006, the Portland Museum of Art purchased the studio from the family and undertook a six-year, multi-million dollar restoration. With the help of construction manager Marc Truant & Associates and historic preservation specialists Mills Whitaker Architects, the PMA performed a faithful restoration, and in the process, uncovered surprise after surprise. Archeological digs turned up treasures like Homer’s paintbrushes, pipes, and a pile of clamshells below the floorboards. Also uncovered were Homer’s etchings on the windowpanes—his name and initials, and on the walls, quotes and lists in his own handwriting. Each discovery required careful analysis, of course, lest some modern-day lumber markings be mistaken for something of historical value. After much anticipation, in September he Museum will open the doors of the newly restored studio to the public for visits. In the meantime, MH+D is excited to share a first glimpse on these pages. Comprised of more than 35 major oils and watercolors painted during Homer’s years in the studio, this exhibition will feature works from museums throughout the country including the Art Institute of Chicago, the Smithsonian American Art Museum, Washington, D.C., and The Sterling and Francine Clark Art Institute, Williamstown, Massachusetts. This exhibition will focus on contemporary photography made with a variety of historic processes available during Homer’s lifetime—from tintypes to platinum prints, cyanotypes to gum bichromate prints. 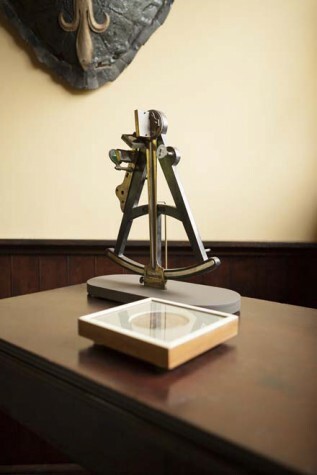 Photographers include Abelardo Morell (camera obscura), Keliy Anderson-Staley (wet-plate collodion), Brenton Hamilton (cyanotype and gum bichromate), Tillman Crane (platinum prints), and Alan Vlach (salted paper prints). Images of the studio will include architectural studies, views of the landscape, interior scenes, and still-life subjects of the few objects that survive from Homer’s day. FOR MORE INFORMATION AND FOR TICKET RESERVATIONS, VISIT PORTLANDMUSEUM.ORG.